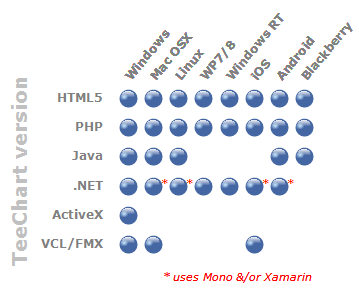 Here's the current cross-platform matrix for TeeChart. * Note both the matrix and the descriptions below are subject to the date of this announcement. 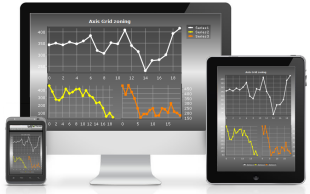 Some TeeChart products have increased the number of supported platforms (ie TeeChart VCL/FMX supporting Android). Ask us for up to date info. The table shows how different versions of TeeChart reach different operating platforms. Using TeeChart C# version in Microsoft's VS.NET you can deliver common-code to Windows apps with Winform, WPF, Silverlight, ASP.NET, Windows.Store, Windows Phone and Compact Framework; you can open that same chart code in Mono and Xamarin for Mono and reach Android, iOS and Mac OSX, you'll just need to think about the interface variations on the different platforms, TeeChart supports all the event/interactivity variations. Using TeeChart for Firemonkey (FMX) in Embarcadero's RAD Studio you can write common code and compile natively for Windows, Mac OSX and iOS. FireMonkey handles most of the interface variations for you making for very light-work. Natively extends across Swing and SWT reaching Windows, Linux, Mac OSX and nearly 'you-name-it' platforms and has been extended to the Android and Blackberry mobile platforms. Most of this can be developed out of one single programming IDE such as Eclipse, if required.